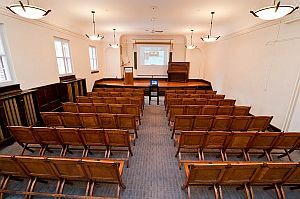 The Auditorium is a fantastic venue for lectures, office events and workshops. The large, windowed room on the second floor has high ceilings, air conditioning, elevated stage and seating for approximately 80 people. The room is equipped with a chalkboard, projection screen, podium, microphone, and Behringer sound system (includes one mixer and four speakers). For those who require a computer projector to show presentations, arrangements can be made. Dimensions: Our Auditorium hosts 950 square feet of seating area. Our Stage (L 9 ft x W 22 ft x H 2ft) has 200 square feet of performance area for your next event!